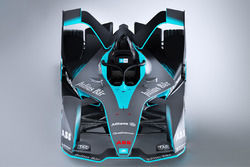 planetf1.com • View topic - 2018/19 Formula e car revealed. 2018/19 Formula e car revealed. Post subject: 2018/19 Formula e car revealed. Post subject: Re: 2018/19 Formula e car revealed. Don't care what anybody else says. I like it. So they've decided to go down the electric LMP1 group. Closed wheels, huge body work and a semi open cockpit. Looks ungainly for the tight street circuits they use and especially annoying as the FE stewards love giving the black and white flag to any car with body work even slightly misplaced. Looks better than the current F1 cars. Very sleek looking but lets see how the real deal looks like in all the more revealing liveries. Is it still considered an open wheel series? The rear wheel pods are gone but I'm sure the diffuser is will take it's place as the piece of body work most likely to end up in the middle of the track. That thing is massive! Hopefully the fact that the rear crash structure sticks well beyond it will be the saving grace. I don't know why they didn't just go for Indy style GE tunnels instead. Double the battery capacity with no car swaps sounds good too. Also, front wing replacement looks tricky, at the moment. Who cares? Formula E is a series with no historical baggage. It isn't tied to what people thought was the quickest way to make a car 60 years ago. It's just not well suited to the circuits they race on, or the way they officiate the race. I love formula E but how many times have we seen the stewards force a driver into the pits to ruin his race because a little body work was hanging off? Now we seem to have just an excess of body work everywhere. I actually think the car would look ok without the huge front wheel coverings. For what it needs to do an FE needs to be sharp and light. This just looks over indulgent and poor fit for the purpose. I really rather like it, looks sleek and fast. F1 could indeed learn from it. It makes current F1 cars look a bit dated. The car looks sleek. FE overall has better liveries than F1 as well. I actually think the car would look ok without the huge front wheel coverings. For what it needs to do an FE needs to be sharp and light. This just looks over indulgent and poor fit for the purpose. But if you think about the what the goals are of FE then you realize that efficiency is more of a driver than speed and fully exposed rotating masses of rubber are anathema to that. Take the Halo away and it would have been even better for me. I like the way this car is developing looks wise though, that's the second next gen car (IndyCar being the other) released recently that has been a major step back towards what i'd consider a beautiful racing machine. Fingers crossed F1 can pull their collective heads out of their rears and follow suit. If you come come at the problem afresh I think covered wheels are beneficial for efficiency and speed. I think generally the extra weight of the covering is more than compensated for by the aerodynamic benefits. Looks awesome I think, even in spite of the halo. I remember when this website was all fields. All the rest are basically blue or white. I always assume blue cars are an eDAMS, but that's not always true. 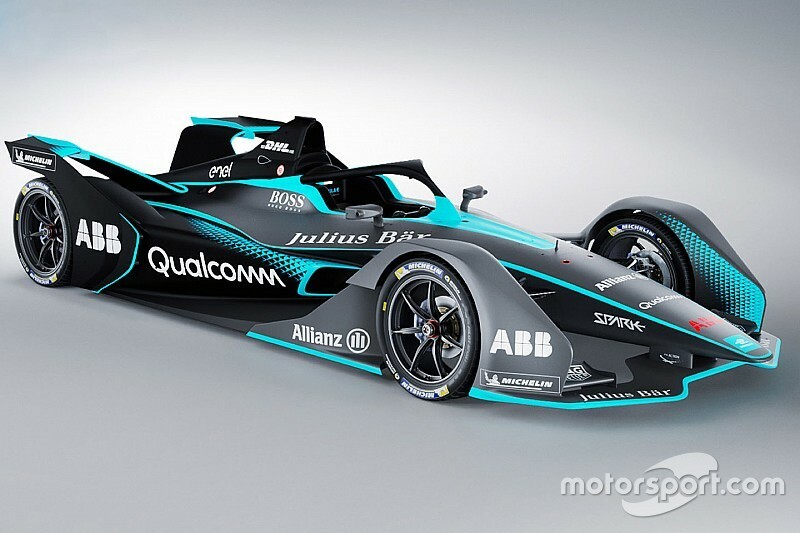 People complain that F1 has too many grey or black cars, but that's nothing compared to blue cars in Formula E.
First time I've seen a Halo car that does not look horrible. Can't wait to see this year's F1 cars though. I like the look of the car, and have the races on Sky+ and watch them when I have the time. I feel the series is being held back by the tracks - I'd love to see them at Silverstone, or maybe in Hungary. Any track where it isn't a street circuit is what I really want.. They should try putting a modern F1 power unit in the back of that thing. Of maybe a couple and see how the aero performs in close racing. Maybe the reduced and split rear wing would help in that regard. The tight street circuits provide a perception (illusion) of speed, as the cars pass track-side objects (and other cars) close aboard. F1 at Monaco gives the same impression (compared with other F1 venues). Put these cars on the wide open venues -- like Silverstone or Monza -- and we will see how slow these cars actually are. Not to mention that watching a Formula E car from a distance, winding its way through the Maggotts & Becketts esses at Silverstone, you will likely not hear anything at all. It looks OK,it's how it performs that counts. I'm so bored of hearing about how slow FE is. The current gen. cars are 190kW and will do about 145mph, which is on par with quite a few racing series. Next season's cars will be 250kW and well within the bracket of 155mph for your average touring car, to 185mph for a GP3 car. Right now they are better suited to street circuits but they definitely seem to be outgrowing some of them. I think a next gen. FE car would be decent enough around Monaco, Singapore, Baku, Montreal or Budapest. I wasn't knocking on the slow speed of the cars. I pointed out that as a visual/audible form of entertainment, they race on street circuits because the tight tracks emphasize movement and the illusion of speed. The opposite is also true... watched today's SpaceX Heavy rocket launch. Without other objects in the frame flashing by, the rocket appeared quite slow, while actually clocking from 5,000-17,000 mph. As a one-time TV Producer, I know a little about these things. Placing the current cars on a wide open circuit with the cameras and microphones far away, and the racing will "appear" and "sound" boring as hell, leading to the immediate death of the sport. It's good to hear that future cars will up the speed ante... BEFORE moving to more wide-open venues. Apologies if I misunderstood, though this was another of those highly original 'milk float' posts I keep reading. You're right, the tight twisty tracks to give an illusion of greater speed but they aren't really much narrower than Monaco or Baku. I'm a big fan of FE but an FE car around Silverstone would look very pedestrian. They'd hit top speed about a third of the way down the hanger straight and would look very slow in the high speed corners. An FE car isn't slow but it is slow when compared to what people are used to watching on purpose built tracks. People watch touring cars at Silverstone, and I think an FE car is probably faster than a lot of them. I reckon FE top speed is quite similar to BTCC. Acceleration is faster. Just in case, there are shortened version of all British racetrack for slower series. It's a beauty and it is much faster. However, I wish FE wasn't so much of a spec series and more open. Electric cars need to be developed and open competition would be more likely to bring innovation.